Emily Brown loves Stanley, her grey rabbit, to bits, even though he is old. Together they have adventures around the house and garden, imagining that they are diving off the Barrier Reef, going up into space, crossing the Sahara on a motorbike or climbing through the Amazonian rainforest. At the start of ‘That Rabbit Belongs to Emily Brown‘ life seems wonderful until the Queen notices Stanley and decides she wants him for herself. She sends envoy after envoy: her chief footman, the captain of the army, the admiral of the navy and the wing commander of the air force. Emily is offered a brand new teddy bear and a tempting lists of toys in return for Stanley, but she refuses them all. She becomes even more angry when the envoys refer to Stanley as Bunnywunny. Eventually she pins a large notice on her back gate stating in no uncertain terms that Stanley is not for sale and that his name is not Bunnywunny. This seems to work for a few months, but unfortunately the Queen has not given up. Eventually she send her special commandos in the middle of the night to steal Stanley. Emily is distraught when she wakes up, and she marches up to the palace to confront the Queen. The Queen has done unforgiveable things to Stanley and is in tears. Poor Stanley has been through the wash, stuffed, and stitched up. He just isn’t right any more. The Queen begs Emily for help. Emily says she will take Stanley home, and she tells the Queen to play with the brand new golden teddy, take him to bed at night, hold him very tight and have lots of adventures. Two years go by until Emily and Stanley hear from the Queen again. One day they are exploring the Milky Way when they hear a knock on the door. This time it’s the postman with a letter from the Queen that simply says ‘Thank you’. At the top, in the middle of the royal crest, is a portrait of the Queen and her golden teddy, both smiling. It is not hard to see why ‘That Rabbit Belongs to Emily Brown‘ was a Nestle Book Prize Gold Award Winner. Cression Cowell has given us an original story chock full of imaginative adventures and a brave little heroine who defends her beloved stuffed toy to the end. What’s more, she knows much more about playing with toys than the ‘silly naughty Queen’. This is a story that has plenty in its variety of situations and characters to appeal to both boys and girls alike. Neal Layton’s accompanying illustrations have a comparable amount of originality. Layton combines photo-montage with his colourful drawings to create the environments where Emily and Stanley have their imaginary adventures. There is plenty of scope here, from sea life and treasure chests at the bottom of the ocean to toucans and monkeys in the canopy of the rainforest. Such pictures could inspire plenty of discussions and provide opportunities for counting or spotting little details. The text is in a large, clear font and almost always on a light background. Sometimes there are a few words in a larger font than the rest or in capitals. Speech bubbles add variety on several pages. The vocabulary Cression Cowell uses is rich and laced with humour. There is a certain amount of repetition, with phrases such as ‘there was a Rat-a-tat-tat! at the garden door’ or ‘And his name isn’t Bunnywunny. It’s Stanley’ occurring each time an envoy visits Emily. Children listening to the story are likely to be able to join in with these, as well as items in the list of toys such as the ten talking dolls that say ‘Mama Mama’. A confident young reader might enjoy the challenge of this story, and the repeated phrases will give them encouragement along the way. This is a wonderful book to read aloud, as it gives the reader the opportunity to take on several very different types of voice: Emily’s, the captain of the army’s, the Queen’s, as well as those of the other envoys. I have also used it as the basis for a drama session with a group of bright four-year-olds. They loved acting it out and pretending to be an admiral or a wing commander. I can imagine it would work equally well with a group of five- or six-year-olds. As there is quite a bit of text and not the simplest vocabulary, I would say that this is a read-aloud book for children of three-years-old and up. Both the story and the characters are wonderful, and I can’t think of any other story book that resembles this one in any way. 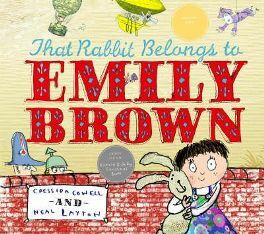 ‘That Rabbit Belongs to Emily Brown‘ would be a book worth having to keep, I’m sure, or one that would certainly make an ideal present. No Comments on "That Rabbit Belongs to Emily Brown"